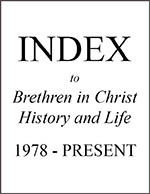 I (Harriet) have been a member of the Brethren in Christ Church since I was 12, having been baptized and accepted into membership at Macha Mission in Northern Rhodesia (now Zambia). When my family settled in the United States, we joined the Grantham (PA) congregation, where I have now been a member for fifty-three years. My membership in the Brethren in Christ Church is important to me. The church is my spiritual family, where I belong. Whenever I have contemplated leaving the denomination (which hasn’t been often, but it has happened! ), I always wonder where I would go. Where else would I feel the same sense of belonging? Questions of membership and belonging were the focus of the 2014 conference of the Sider Institute for Anabaptist, Pietist, and Wesleyan Studies at Messiah College. The theme of the conference, held in October 2014 at the Carlisle Brethren in Christ Church, was “Who’s In? Who’s Out? Rethinking Church Membership in the Twenty-first Century.” The conference explored such questions as: Does church membership matter in the twenty-first century? What does it mean to “belong” in a post-Christian society? What are the connections between membership and the concepts of conversion, discipleship, and accountability in the church today? Can we revitalize church membership? Should we? In this edition of the journal, we continue our tradition of publishing papers based on the presentations at the conference. Kurt Willems, church-planting pastor in Seattle, Washington, represented a new generation of churchleaders and -goers in his keynote address, “Does Church Membership Still Matter? Reflections on ‘Belonging’ in Twenty-First Century Christianity.” For the new generation, a sense of belonging to a church community is often expressed in other ways besides membership. The other three conference speakers—Jay McDermond, professor of Christian ministry and spirituality at Messiah College; Daryl Climenhaga, associate professor of global studies at Providence Theological Seminary; and Valerie Rempel, associate dean and associate professor of history and theology at Fresno Pacific University Biblical Seminary—further explored the meaning of membership and belonging. The other major article in this issue focuses on a key aspect of Brethren in Christ life and thought: peace. During the 2013-2014 academic year at Messiah College, Brooke Strayer served as a Wittlinger Fellow with the Sider Institute; in that role, she conducted the historical and sociological research presented in this article. She makes the compelling case that the trajectory of the Brethren in Christ peace position, at least within the U.S. church, has moved from unity to disunity, with fewer and fewer church members and leaders affirming the doctrine. The article raises important questions for those who care about this important topic. The book review section highlights four very different books, ranging from a history of Mennonite Central Committee in Canada, to understanding vocation and God’s calling on our lives, to spiritual contemplative practices, to a fresh portrayal of Amish life. We always welcome responses to journal articles. In the December 2014 edition, we published an excerpt from Dan Jennings’ master’s thesis, “Familiar Ground: Brethren in Christ Pastoral Care for the Twenty-First Century” (pp. 374ff). Harvey Sider submitted a response to that article, and we invited Dan to respond to Harvey’s comments. Both responses are printed here. Does Church Membership Still Matter?